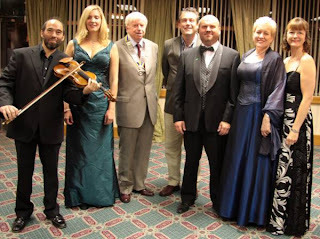 Ponteland Online News: A GRAND NIGHT FOR SINGING ... AND FIDDLING! A GRAND NIGHT FOR SINGING ... AND FIDDLING!
" Tremendous! - that was the verdict of the 300 satisfied guests at the 26th consecutive Ponteland Rotary Club Gala Concert at the Britannia Hotel. This annual event in aid of various Rotary charities, local and worldwide, never fails to attract a full house and, this year opera star Graeme Danby (bass) had assembled a richly talented ensemble comprising Valerie Reid (mezzo), the American soprano Sena Larard and, this year's exhilarating innovation, the Northern Sinfonia leader, Bradley Creswick on violin. As ever, the programme ranged from Gounod to Gershwin and Beethoven to Boswell, a perfect miscellany of quality music and mirth. Bradley Creswick delighted with a range of contrasting items and brought the house down with the exciting Hungarian 'Czardas'. Underpinning every item was the brilliant Lydia New lands on the piano. 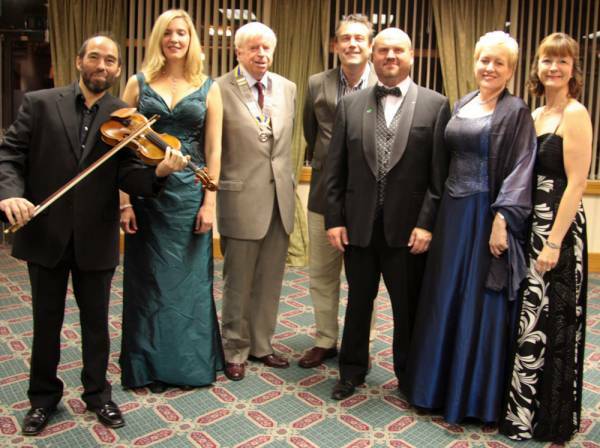 Pictured are the artistes with Rotary President Ray Tipping and Audi sponsor Andy Maidwell. The Rotary Club of Ponteland would like to thank the Ballinger Charitable Trust, Newcastle Audi, Cowells Garden Centre and the Britannia Hotel for their continued sponsorship and support for the event which this year raised over £3,200 for Rotary Charities.